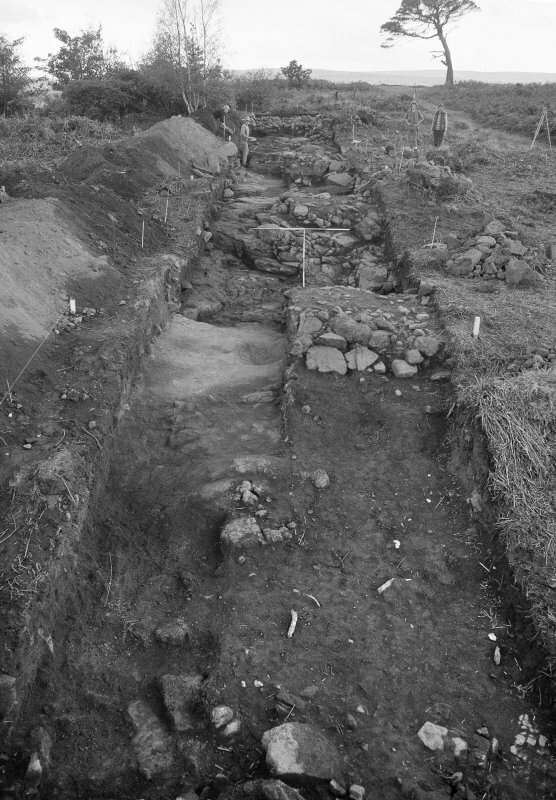 Excavation photographs: Gillies Hill excavation. 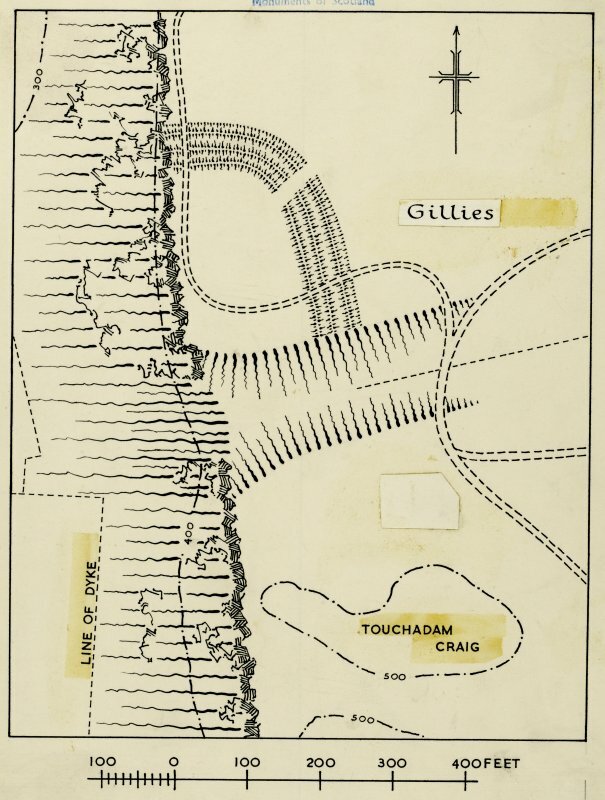 Sketch plan; fort, Gillies Hill. 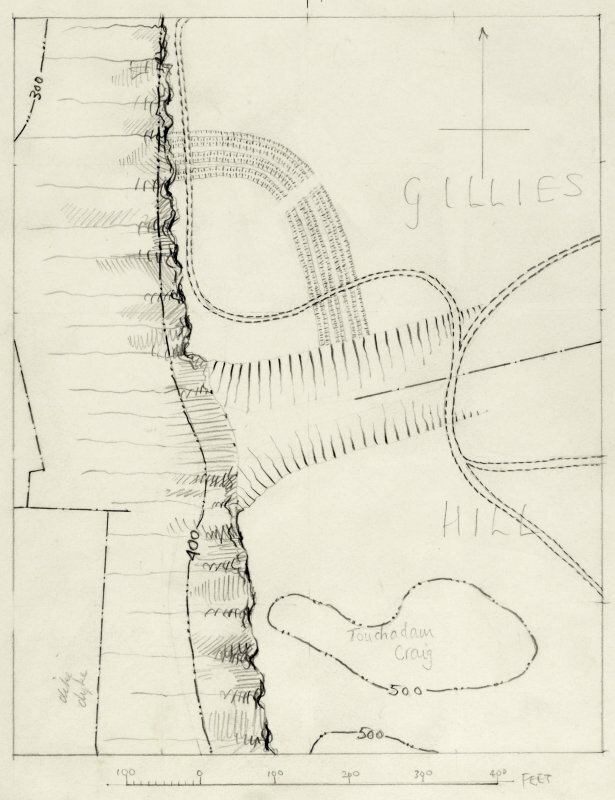 Publication drawing; fort, Gillies Hill. (NS 7687 9176) A fort is situated on top of the steep crags forming the W face of Gillies Hill, where the line of the crags is interrupted by a gully. The remains lie in a plantation and were partly hidden by lopped branches when visited. The angle formed with the crags by the N side of the gully is cut off from the rest of the hill by three ramparts, enclosing an area about 240' N-S by 180'. The ramparts now consist of low banks spread to a maximum width of 15'. A few earthfast boulders protruding from the banks probably represent wall-faces. The ramparts are pierced at two points by a winding forest track, but it seems likely that another gap, on the NE arc, marks the position of the original entrance. This area of Gillies Hill has been largely cleared of trees leaving hummocky ground and uprooted tree stumps. There are now only vague unsurveyable traces of a single rampart. NS 768 917 his fort measures 70m by 55m and is defended by three ramparts on the N and E, and by crags and steep slopes on the S and W. It has been severely damaged by forestry operations. The fort is threatened by quarrying for roadstone. In September 1984 a trial trench, 39m long and 4m wide, was opened across the defences in the south sector. Three stone faced ramparts survive. The innermost, Rampart I, was c 3.0m thick rising to a height of x 0.8m with facing on the outside only. Rampart II, c 5m out from Rampart I, was less well preserved with only traces of facing. The core material was c 2.4m thick and c 0.2m high. Rampart III, c 3.0m thick and c 0.6m high, was faced on both sides with stone quarried from in front of Rampart II. Material for the construction of the rampart cores had been obtained by surface quarrying of the surrounding soil, exposing the bedrock. Overlying the bedrock within the fort was a layer of occupation debris containing pottery, including the upper half of a decorated vessel. A substantial part of a large coarse vessel was found in the core of Rampart II. Other finds include a small crucible and most of a well made stone bracelet. This fort occupies a triangular promontory formed where a broad gully breaks through the cliffs on the W flank of Gillies Hill. Having been cleared of the plantation that had covered the area since the early 19th century, the fort now lies in a bracken infested clearing. Three ramparts cut off the approach to the promontory from the N and E, describing a shallow arc to enclose an area measuring a maximum of 90m from NNW to SSE by 40m transversely (0.19ha). The entrances are probably on the N and E where the ramparts appear to terminate short of the cliff-edge. The interior is featureless. In 1984 a trial excavation across the southern end of the defences revealed that the ramparts measured about 3m in thickness, comprising rough stone facings and a core scraped up from either side; the outer, which is generally the best preserved of the three, stood 0.6m high in this sector (Rideout 1992). Apart from sherds of two Early Bronze Age Beakers, finds included parts of two large Iron Age vessels, one incorporated into the core of the middle rampart, and the other into an accumulation of material behind the inner rampart, and part of a stone bracelet from behind the outer rampart. Of three old radiocarbon dates, the most recent may be from an intrusive sample and the other two point to an Early Iron Age occupation.